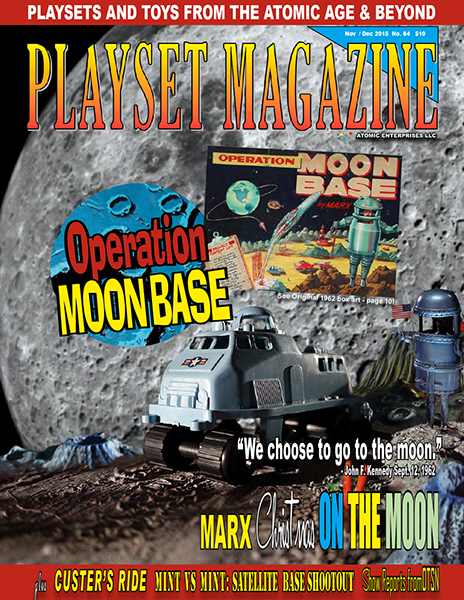 PLAYSET MAGAZINE ISSUE 84: OPERATION MOONBASE! Holiday Allotment - a supersize ration of Marx Holiday Fun and Good Cheer, and why yes, that is exactly on schedule as we have been since 2001 and this odyssey began!! In the current hit movie “THE MARTIAN” a botanist (the ever-engaging Matt Damon) shows us how exciting science and biology can be. He goes on a search to find a decades-old technology to help him out. 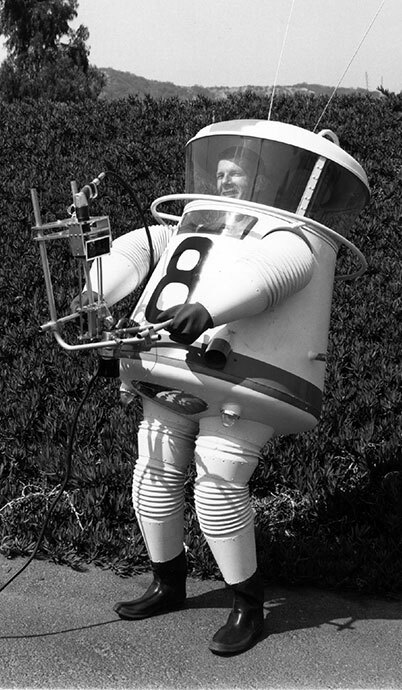 He’s in a very cool space suit. 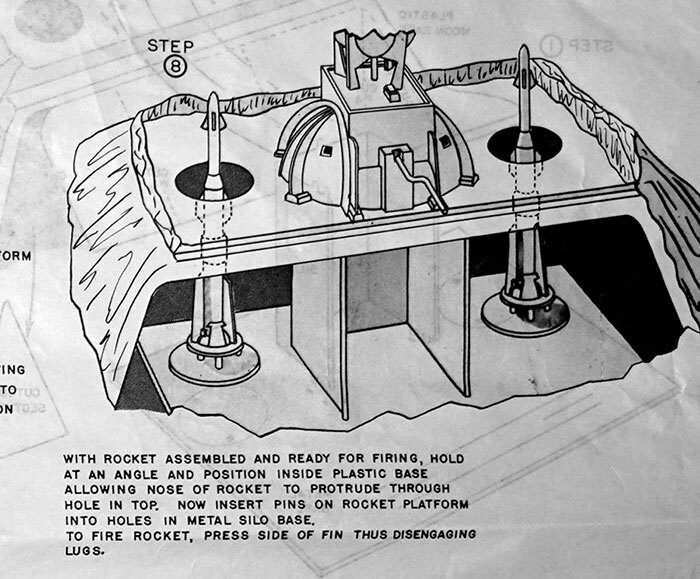 And the rockets and space equipment are unbelievably cool, but they look real. And the ending! It’s perfect space-timing for our own adventures out there, only not quite so far away – a place you can reach in two or three days instead of years: The Moon. And since we're going, let’s make it Christmas on the moon! That’s exactly what we are doing – Playset Magazine issue 84 welcomes you to the surface of another planet for a whole host of adventure as you and your family prepare for the warmth and beauty of this arriving holiday season. You'll see the original carton art for this set, and meet all the scientists and technicians currently living on the moon and building Operation Moonbase. See all the accessories close up and in detail, too. Make your way around the crater to see the wonders that are inside this single giant Marx terrain piece – the biggest they ever made. The moonscape becomes the halls of OTSN – the world’s greatest toy soldier show and sales event of the year. This is the 35th one and we keep returing to an ever-changing and expanding selection of sets and toy items, and we made sure you’ll see a ton of them in this issue. But there are more notes of importance – this year the Old Toy Soldier Show is under a ‘change of orders’ scenario where great friends, Don Pielin and Steve and Jo Summers, are relinquishing command to a new and highly capable team of headliners. Roger and Jan Garfield, who have been with the shows management ever since it began, will be taking over. And you know them better than you think! Roger is the artist and graphics expert who creates those great OTS ads. Here’s another newsy item: Is it the “OTS” show, since the Old Toy Soldier Magazine dropped the Newsletter nomenclature in favor of the fine looking publication it is and always has been? Or is it still the “OTSN” show? Whichever you use (and people frequently interchange the nomenclature), its really the place to be at the end of September. We simply ran out of “space” for the Ideal Story seen on cover mock-ups visible on our website these past few weeks. That story will appear in another issue. We hope that is OK with everyone. Click HERE for more on this near cosmic cover catastrophe! Next it’s a return trip to the lunar surface to see a lunar Monorail from collector Joseph Svec, and look back to 1963 as John F. Kennedy visits the real Operation Moonbase in a secret Air Force installation. We’ve got the photos to prove it! Don’t forget to compare two complete and factory condition Marx Satellite Base sets in “Mint VS Mint: Marx Satellite Base”! Here you get to look over two dead mint sets – did Marx really make each one perfectly alike? Really? But wait – what’s that!! As the holidays are upon us, we want to thank each of your for being a PM subscriber. You are all very important to us. And a heartfelt thanks to each of our staff and contributors, without whom this publication could not look anything like it does or be as filled each issue with the informative, hard-as-nails facts that make the playset hobby so rewarding. So happy Thanksgiving to you and your family, and Merry Christmas to each and every one of you. So now, what will you find on the moon during your visit?